My poor little boy spent most of the weekend under the weather with a case of the stomach flu. By Sunday night he was well recovered and starting to bounce off the walls, but I still wanted to send a very gentle lunch yesterday morning. 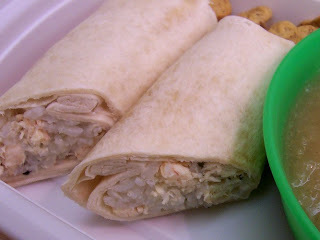 For my little Barfasaurus I combined leftover chicken with white rice wrapped in a plain tortilla, which was rolled burrito style for ease of handling. 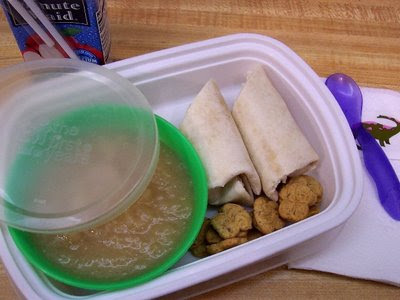 Along with it are homemade applesauce, a few graham cracker bees, a juice box, and dinosaur sticker. It's packed in one of the Chinese take out containers I save to use for grown up lunches. He ate everything except for half the burrito, so I'm pleased both with his recovery and how well he managed the containers. Maybe next year I be able to start using a thermos...it's fairly disturbing how much the possibility excites me! I save those containers too! What awesome recipes you've created. You are so creative. I'm going to try some of these. Very interesting. Thanks for stopping by my blog.